This detailed map covers the area west of Croydon which includes Beddington village and Waddon, with coverage stretching from Beddington Park eastward to Vicarage Road, Waddon. Features include St Mary's church, Beddington House, cemetery, Royal Female Orphan Asylum, River Wandle, Waddon Mills with Waddon Marsh New Siding, Wandle Mills, Croydon Sewage Works, part of Wandle Park, Waddon Lodge, Paragon Works, Waddon Court (whose 18th century occupant, John Parker, rode around the village each morning accompanied by a monkey dressed in fine clothes), Croydon Gas Works. 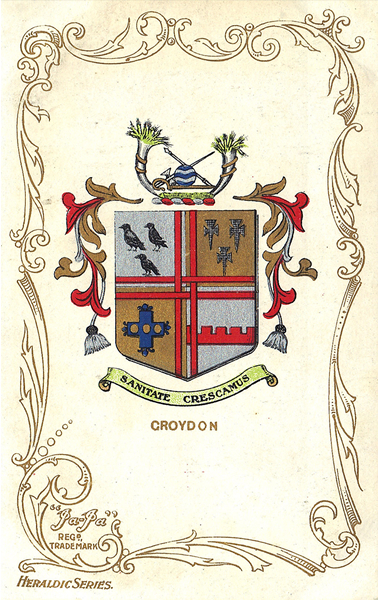 There are street directories for Beddington Lane, Bute Road, Church Lane, Croydon Road, Demesne Road, Guy Road, Wandle Road; plus a railway timetable for the Croydon-Wimbledon line in 1908. You might find this Index map useful. The map links up with Surrey Sheet 14.05 Mitcham Road to the north, 13.12 Carshalton to the west, 14.10 Central Croydon to the east, 14.13 South Beddington to the east.